It's as if the weather knew Memorial Day was coming and kicked in just in time. Our first truly hot weather, arriving as if to nudge us toward the pools, to breezy waterfronts and cookouts, bicycles and kids running through sprinklers. Weather that makes you think of cold beer, grilled meat, and pie, and makes you wish the first summer tomatoes were in season. Well, we can help you on at least one of those items with Grilled Spicy Beef Salad. I like this dish better with its more traditional Thai name - dripping beef salad. It's dripping because thin strips of beef are flash-grilled, then they are quickly dipped into a flavorful spicy broth mixture, and then the beef and broth mixture are poured over the salad like a warm dressing. Paul had been saying he wanted an Asian cookbook, and so for his birthday I got him Jeffrey Alford and Naomi Duguid's book Hot, Sour, Salty, Sweet. I have secretly been eyeing this book for years (really, years), but I would have never bought it for myself since I don't cook much Asian food. However, this book has already been a standout (the Ginger Fish, which calls for 2 cups of matchstick cut ginger, is phenomenal), so clearly I had a great excuse. I made a couple changes to the recipe, most importantly reducing the number of Thai chillies. Hello spicy! It was delicious but we just aren't there yet in our tolerance, so one chili it is. Finally I added some peanuts, because I just really like peanuts in Asian salads. This is a seriously delicious salad, and that's coming from someone who rarely eats beef. The meat is flavorful and tender the greens and herbs keep everything light, and just the right amount of spicy feels good on a really hot day. I'd show you a picture of the finished dish but I'm afraid we ate it too fast. This is not a complicated recipe but it needs to be done fast, so be sure to use a good mise en place and read the recipe through a few times before you get started. Your butcher may sell already sliced sirloin, or you can ask him the slice it for you. 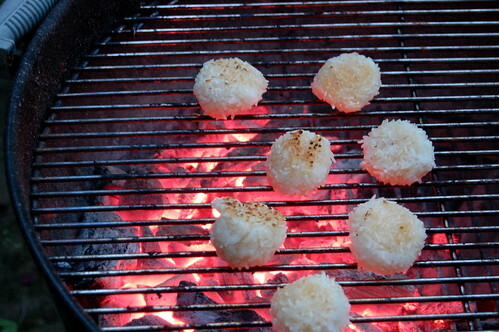 Serve with rice, or grilled sticky rice balls (pictured above). 1. Preheat a grill. 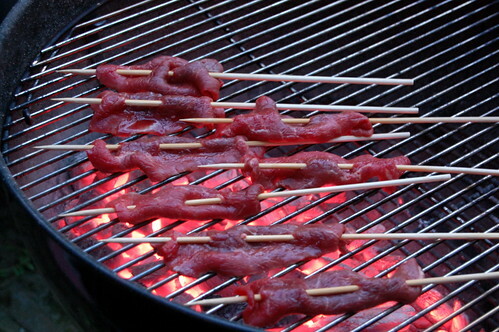 Thread sliced beef onto skewers and season with black pepper. Set aside. 2. Meanwhile, assemble the lettuce and cabbage leaves in a large salad bowl and place in the refrigerator. Have peanuts at the ready. 3. 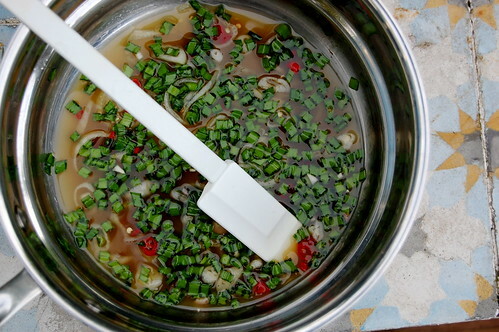 In a medium sized saucepan, combine the broth, lime juice, fish sauce, sugar, and shallot rings. Set to a low simmer. 4. Grill the beef for 2-3 minutes on each side - it is important that it still be rare. Transfer beef to the kitchen, remove from skewers, and add all the beef to the pan of simmering broth. The beef will finish cooking in the broth, this should only take 1-2 minutes. Using tongs, transfer the beef to your prepared salad bowl. Add the scallions, chile, and mint to the broth and stir to combine. Pour the broth mixture over the salad. Sprinkle with peanuts, serve immediately. Wow, that looks tasty. What about the sticky rice balls? How do we make those? The sticky rice balls are easily found by googling, but here's what I did. Cook sticky rice according to package directions (soak then steam in a conical steamer). Let cool slightly, season with salt. Using DAMP HANDS form the sticky rice into balls, you can just sort of smash/knead it together, they will stick. Make sure to dampen your hands before forming each ball. Brush the balls with either (a) a little bit of sesame oil or (b) a little bit of beaten egg. Grill until browned on both sides. Apparently in Korea they form the sticky rice balls around sticks and roast them like we roast marshmallows. You can also mix seasonings or fillings into the rice balls. Yum! Each food item looks so good! Friends of mine had that cookbook and made us some great meals from it.